there’s a lovely artist from ireland named fiona hallinan, who started a very cool project called heterodyne, for which she commissions different composers to create a soundtrack for a specific journey somewhere. 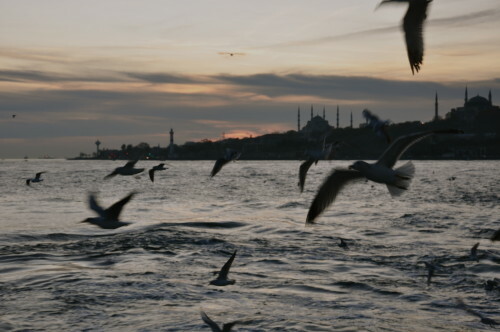 fiona contacted me last year and asked if i’d like to create a musical score for a 17 minute ferry ride in istanbul known as the bosphorus. i had actually been on that ferry a few years back and had a vivid memory of how beautiful it was. so naturally i was thrilled to be able work on some music with that recollection in mind. for all you smartphone users out there, there is now a heterodyne app. once you have the app, you can stream the different scores when you are within 30 kilometers of the location they were created for. i don’t even have a smartphone, but i think that’s pretty cool! and i believe you might be able to stream each score once from any location. anyhow, if you’re hip with the times, check out the app, and maybe tell me how you like it! i will say that i’m really proud of the 17 minute piece of music i created for this project. i have great memories of dancing like crazy all by myself while working on the final mix. here’s a photo i took when i rode the bosphorus several years ago. This entry was posted on Wednesday, February 4th, 2015 at 9:34 pm	and is filed under News. You can follow any responses to this entry through the RSS 2.0 feed. You can leave a response, or trackback from your own site.